Ice hockey is the ultimate team sport. Even Sidney Crosby and Alex Ovechkin need to pass the puck in order to provide themselves with the opportunity to score as many goals as they do, and allow their teams a greater chance of winning. Learning how to work as a team is crucial to playing ice hockey. Every player has a different set of skills and weakness, which can be combined and leveraged to elevate the collective performance and effectiveness of the group at large. The same principle can be applied to many people in many fields: coaches, musicians, businesspeople, and in this case: The Hockey Foundation. A founding principle of The Hockey Foundation is practicing what we preach, and collaboration is essential to our mission, not only because it directly benefits our programming, but because it's the right thing to do. Many of the organizations and people we've partnered with are doing great things, and through collaboration we are able to be more effective and efficient in our respective objectives and ultimately help those that need it better than going it alone. In 2011, The Hockey Foundation officially partnered with the Ice Hockey Association of India, the official body responsible for ice hockey in India (as affirmed by the IIHF, IOC, Indian Sports Ministry and other governmental bodies), making our hockey camps the only nationally-sanctioned ice hockey coaching programs in India. 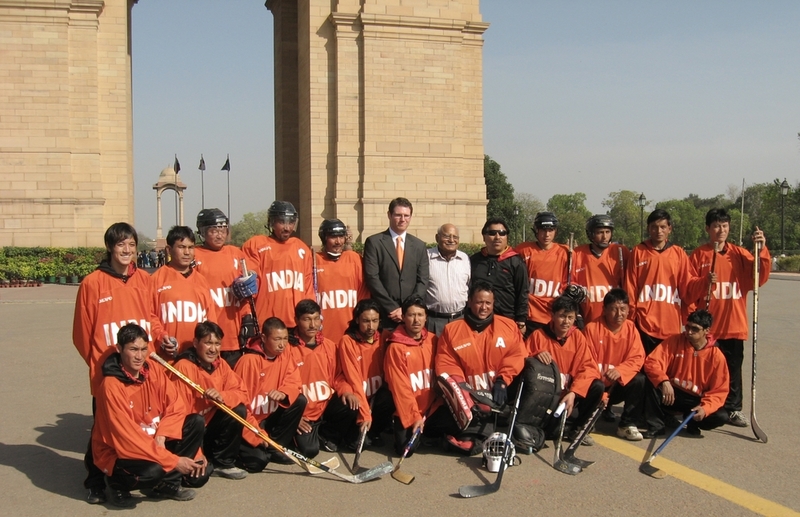 While we could have easily run hockey clinics in Ladakh (and other parts of India) independent of IHAI, it was in everyone’s best interest to create a partnership that not only fulfilled the mission of The Hockey Foundation, but helped establish, strengthen and support the growth of IHAI within India, as it’s been an uphill battle for the association. To meet those goals, we charge a nominal coaching fee for all participants who attend our camps. Why do we charge, you ask? Good question. There are many reasons. 1. Enrollment. Our camps require all players to be registered with the Ice Hockey Association of India, just like players in USA and Canada are required and expected to do within those national bodies. We’ve increased the enrollment for IHAI by over 300 players and growing. 2. Fundraising. More specifically, the funds go to the Ice Hockey Association of India to help pay for the Indian National Team to participate in tournaments and development camps, cover limited, specific expenses relating to The Hockey Foundation coaching in India. 3. To create value. There is substantial research and information to support that associating a product or service with a cost impacts the perceived value of said product/service. We charge rates that are low, even for Indian standards, as we are not looking to turn a profit or lose out on getting as many players on the ice as possible. Our rates are set in collaboration with the Ice Hockey Association of India, and all players receive IHAI certificates of participation, which carries greater value in Asia than in North America or Europe. 4. To discourage entitlement. When people receive handouts with no strings attached, there’s a fine line between receiving support on the generosity of others and expecting others to give everything to you and/or do everything for you. This has been a particular issue in Ladakh where the population has become reliant on a variety of sources for support instead of taking charge of their own situation and success. Since teaching accountability is a major focus of The Hockey Foundation, discouraging entitlement is presented along with lessons on teamwork, honesty and accountability. We continue to battle entitlement and expectations around Ladakh, from expectations of equipment donations to expectations of time spent coaching in a particular town/region. We’re actively working to curb this mentality. In addition to our collaboration with the Ice Hockey Association of India, we collaborate with local clubs and associations, such as the Ladakh Winter Sports Club, Kargil Ice and Snow Sports Club, Simla Ice Skating Club, SECMOL (Students’ Educational and Cultural Movement of Ladakh) and have developed partnerships with ILSC (International Language Schools of Canada), Ice Hockey in Harlem and Health Inc, along with volunteer coaches that come to Ladakh with a desire to help people in a remote, under-served, and beautiful region of the world. Bringing as many organizations and people in to the fold has been a challenge, but a welcome one. For one thing, The Hockey Foundation has become responsible for more and more equipment every season, which means that along with extra time & effort, we have to deal with extra politicking, as every organization feels they deserve the most/best equipment. Dealing with equipment distribution is difficult, but the greater challenge is ensuring that every person and organization not only meets their respective goals, but that they understand and adapt to the philosophy and mission of The Hockey Foundation. This takes a lot more effort, but comes with greater reward, as we feel our instruction focuses on building better human beings, not just better hockey players. From day one, The Hockey Foundation has been impacting lives on both sides of the planet, and it continues to do so. The people and organizations we’ve partnered with have been inspirational to me personally, and have renewed my enthusiasm and motivation time and time again. From the donors who have contributed money and/or equipment, to the organizations that are doing great things, I continue to rediscover why I started The Hockey Foundation in the first place, and find new methods of effectiveness. Organizations like Hockey Dreams Foundation in Minnesota give equipment and scholarships out to players who can’t afford, and Ice Hockey in Harlem provides underprivileged kids around New York City an opportunity to build a future through ice hockey and stay off the streets and away from crime, and has donated excess equipment to The Hockey Foundation. International Language Schools of Canada has donated well over a hundred pieces of equipment to Ladakhi hockey players through The Hockey Foundation. Health Inc. has been supporting youth programs in Ladakh for decades, and has been integral to growing the game throughout the region. Ladakhi Childrens’ Schooling Project brings students from Ladakh to the US for study, and SECMOL has been a not-always-welcome but definitely effective disruptor in Ladakhi educational standards, with the support of many western volunteers, including yours truly. As we work towards building a two-way exchange program for students in the USA and Ladakh, we’re excited that organizations like IHIH, ILSC, SECMOL, Health Inc., and Ladakhi Childrens’ Schooling Project will be with us throughout our growth as an organization. Beyond the organizations, there have been people that have connected with The Hockey Foundation over the years. Paul was a volunteer coach that happened to be in Ladakh at the same time as Alex and me in 2011, and quickly became an integral part of our coaching program. When Alex and I returned to Ladakh in 2013, Paul was once again with us and became responsible for much of our Kargil District and Changtang region coaching, and was joined by fellow Canadian Antoine who reached out to The Hockey Foundation to support our coaching. This year, Antoine is once again returning to Ladakh around the same time as Alex, and is bringing along a friend to also be a part of our coaching. This year, Antoine will be our Kargil District Coordinator, while Alex will be bouncing around the whole region taking the incredible photos and videos I hope connects you to what we’re doing here. Volunteer coaches are always welcome, as are equipment and monetary donations. Our trips are quite expensive, but we’re making a difference in lives around the world, and that is priceless. You may or may not be aware that along with being the founder, Head Coach and Executive Director of The Hockey Foundation, I'm also the Head Coach of the Indian national ice hockey team. 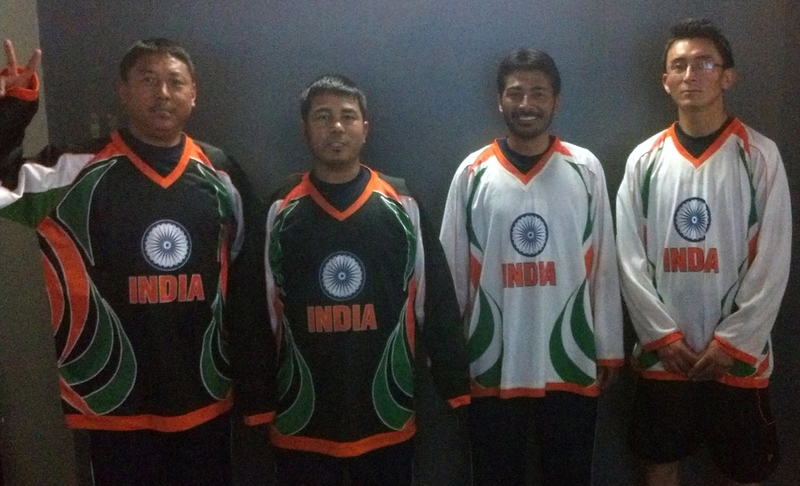 Yes...that's right...India has an ice hockey team. While on the surface it may appear to be similar, no, it's not like Jamaican Bobsled (as depicted in the movie "Cool Runnings". Whereas in Jamaica it was a group of men who trained for the Olympics in the US for a sport very much unfamiliar to their nation, in India, ice hockey has been around for about 100 years in the mountainous regions where the game can actually be played outdoors, and we do not compete at a level even close to the Olympics. In fact, we're one of the lowest ranked teams in the world, and that's OK. The players on my team are comprised of military and civilians. They're respectful, hard-working, absolutely love ice hockey, and come from limited means. Many do not own the equipment that they use, often borrowing from their friends that do not get the opportunity to represent their country in the IIHF Challenge Cup of Asia, a developmental tournament for low/un-ranked Asian hockey nations. Due to the lack of popularity and support for ice hockey in India at large (it's immensely popular in Ladakh, where 90+% of ice hockey in India takes place), the players have to pay their own way in order to play. It's an unfortunate reality. Until the team can garner some sponsors and/or government support (unlikely, considering the significant preference for cricket in India) the players will be expected to pay for themselves, which many can't do, ultimately creating a financial burden on their family and reducing the pool of players available to play for Team India. It became clear to me a few years ago that coaching the Indian team is not an objective or of The Hockey Foundation, nor is it relevant to the mission. By no means does that diminish the importance I place on having the responsibility to select, train and coach those players. I am honored to have the opportunity to be the head coach of a national team, no matter our performance, and I care deeply for the success of the program and the players, coaches and officials that have been a part of it. First, I thought about all of the jerseys being worn by the players. These jerseys would most likely sit in a room for 8 months before being worn again in the following winter by those players that got to wear their nation's colors. But couldn't those jerseys be more beneficial if sold to collectors and/or supporters? Not only would someone be able to acquire a truly rare and collectible piece of hockey memorabilia, but the proceeds would be divided between the players themselves and The Hockey Foundation, as facilitator and mediator in the process. Many of the players wanted to retain some of their jerseys, so I was able to ensure that every player received another set of new jerseys upon their return to India from the Challenge Cup of Asia, which was hosted in Bangkok in March, 2013. Everyone got to retain their memento for playing on Team India, and we all agreed that this was a great way to make back some of their significant financial burden. But for those that can't afford a game-worn jersey, the Ice Hockey Association of India was able to have a handful of official Team India jerseys made before my departure from Delhi, with proceeds supporting The Hockey Foundation as a unique fundraising memento. A new plan of action for this upcoming season is to be proactive in the team's fundraising efforts. 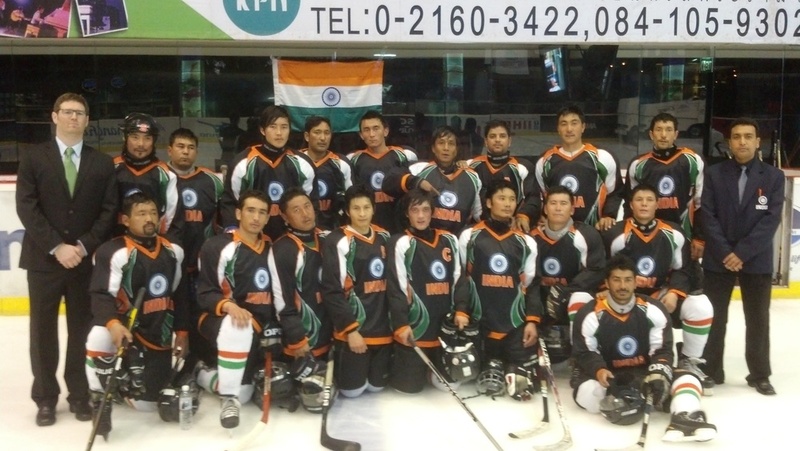 To date, every player that has played on the Indian national ice hockey team is either from or lives in Ladakh. They are a part of the community that The Hockey Foundation supports in our programming, and many have participated in our coaching clinics. This year, all players have been notified, well in advance, of the expectations placed on them, including the incentive in driving enrollment in our coaching clinics, as we collect a nominal fee for the Ice Hockey Association of India to support the national association's growth and development. The more we raise in India, the more money that can be allocated to the national team, and ultimately less is expected from each player/family. This push for Ladakhis to take ownership over their own success is a major mission of The Hockey Foundation, as Ladakh has an issue with apathy, complacency and a reliance on outsiders to keep on giving money and equipment. We've adjusted our methods for donating hockey equipment due to this realization, and have become more strategic, thoughtful, and collaborative in our distribution of equipment and the expectations associated with an organization receiving our support. It's a constant work in progress, but one I'm happy to undertake and improve. Although being the head coach of the team is not a part of The Hockey Foundation, I believe supporting the players, the team and the association are, and that support in turn helps The Hockey Foundation. Our organization's are inextricably linked. And I wouldn't have it any other way.